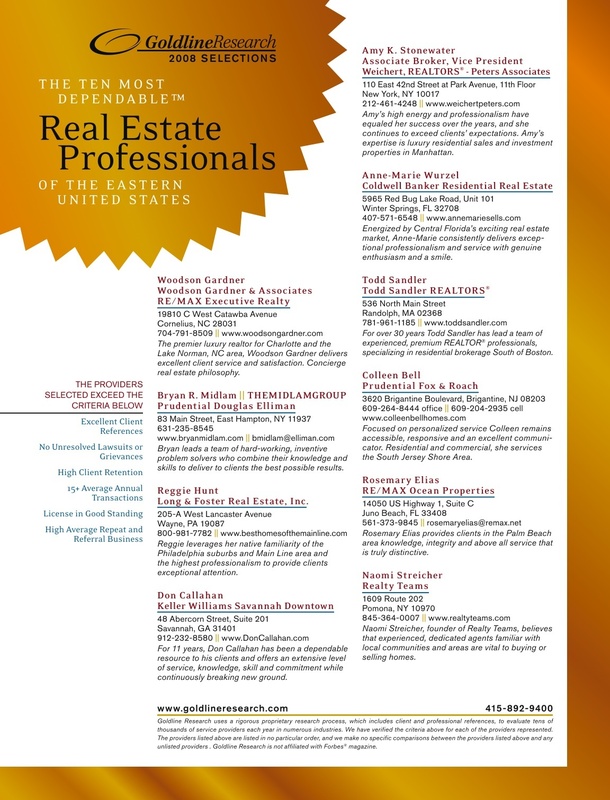 Anne-Marie Wurzel, Coldwell Banker Residential Real Estate was selected as one of The Most Dependable™ Real Estate Professionals of the Eastern United States for 2008, and has been published in the December 22nd issue of Forbes by Goldline Research. As an independent third-party research firm, Goldline Research sets the standard for dependability in professional services industries across the United States. Anne-Marie Wurzel, Coldwell Banker Residential Real Estate was chosen in this region to receive this prestigious designation. Goldline Research undertakes an extensive research process to review all qualified applicants in a respective area. Goldline’s consumer-centric evaluation method is specifically tailored to evaluate providers for how well they service their clients’ needs. The proprietary research process used includes in-depth interviews and quantitative analysis of key provider data, as well as customer reference checks to confirm exceptional levels of customer service. Those that ultimately earn Goldline Research’s Most Dependable™ designation show that they have the characteristics that are essential for continued success and leadership within their industry. By being selected as one of The Most Dependable™ Real Estate Professionals of the Eastern United States, Anne-Marie Wurzel, Coldwell Banker Residential Real Estate has demonstrated commitment to outstanding customer service, indicating that clients are the most important facet of their business. To contact Anne-Marie, click here.